Why you’re not taking action. Have you ever wondered why you don’t take the action you need to take to achieve your goals? Or why you do keep taking the same actions even when you know they aren’t healthy choices for you? Sometimes it feels like you’re so out of control, right? Here’s the deal: there are only a few things that you can’t control. They are your circumstances, in other words, what’s outside of you. Other people, your past, the economy, the weather… you just cannot, no matter how much you might try, control these things. The good news is that you absolutely can control everything within you, including your thoughts, feelings and actions! Everything in your internal present experience you have choice and agency over. Even your conscious thoughts, which sometimes feel like sneaky interlopers, are within your control. We so often forget this, right? Or often we don’t even know what we are thinking! We haven’t taken the time to step back and examine our thoughts. If you’re wanting lasting change to occur in your lifestyle, it’s hugely important to observe and witness your thoughts. Why? Because your thoughts become your feelings. And then your feelings become your actions. 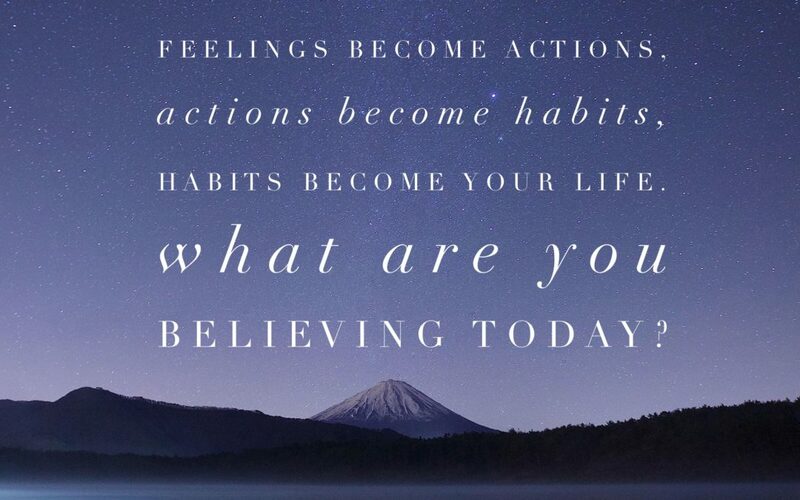 And – you guessed it – your actions become your habits which then become your life. It all starts from the level of belief and thought. Every single thing we do or don’t do in our lives is because we want to feel a certain way. Feelings are the most paramount driver in our lives. To understand why you are or are not taking action, you must also get familiar with the feeling fueling your choice. Behind every feeling is a thought or belief (I’m using thoughts and beliefs interchangeably in this blog post). Therefore, you must start to understand your thoughts. How can I do this, you might ask? Aha! This is where meditation can be a great asset. Just taking time to pause and separate yourself from your own mind. Observe your thoughts as they come and go without attachment or judgement. Get curious, watch yourself think. It can also be extremely helpful to have a coach to help tease from your the deep, dank thoughts and beliefs that haven’t shone themselves to you in some time. When you start to clearly see your thoughts that drive your feelings that create your actions, you empower yourself to make the decision whether or not you actually want to change. Maybe, when push comes to shove, you actually don’t? But trying to change from the action level alone without this behind-the-scenes sleuthing will be most likely frustrating, and perhaps even futile. Instead, look into the big WHY you’re doing or not doing something. It may take a bit of reverse engineering. For example, when I’m so full and my stomach is bursting full but I continue to eat chocolate pudding right out of the container even when I know I should stop I can ask myself “what is the feeling driving this action?” Often, for me, the feeling is loneliness. Then I looks deeper and ask myself “what is the thought that is causing this feeling?” Often the thought/belief sounds something like “I’m alone in this world and no one loves me.” From the moment of identifying the core belief I now can take agency and start to change it. Or not. I have the power and it’s up to me. So start to pause and look inward with compassion, fascination and understanding; refrain from beating yourself up. Notice your thoughts and know that you have control over them. Reveal yourself to yourself. With this first step, big change can happen easily and joyfully! Just what I needed to hear this morning! Thank you Elise! I love “reveal yourself to yourself”. I have been working on my reveal and figuring out my feelings for years now. :) I put things into the light, transformed a lot with the help of my amazing life coach, and eventually I was able to let go of a lot of things. It seems, though, things/stuff just keep wanting to come to the surface and I am not always ready for the next reveal. And I, myself, am a health coach! It is interesting that when I think about my goals it seems simple to just take the next step. At the same time, there is often this subconscious pull back from going forward. However, I am also noticing these days that when the step seems just the right amount of stretch, I am much more likely to take action. Beautiful piece Coach Elise. Your deep thinking is inspiring!